Specially designed for teeth that are sensitive to whitening. Are you gun-shy about whitening your teeth because of your fear of whitening related sensitivity? Crest 3D White Whitestrips Gentle Routine reveal your beautiful, whiter smile gently and gradually, with just 5 minutes a day. Now there’s nothing preventing you from getting a whiter, brighter smile. Discover your smile’s full potential when you use the complete teeth whitening collection of award-winning products from Crest 3D White. From teeth whitening toothpaste to whitening strips, Crest 3D White offers the best teeth whitening solutions for your daily oral care needs. Plus, when you use the collection together, you’ll see a whiter smile faster. Like the ingredients in your haircare that boost shine or the moisturizer in your makeup that provides anti-aging benefits, Crest 3D White Whitestrips rejuvenate for a whiter smile. Crest 3D White Whitestrips go beneath the enamel surface for noticeable results. Are you concerned about whitening your teeth for fear of whitening-related sensitivity? 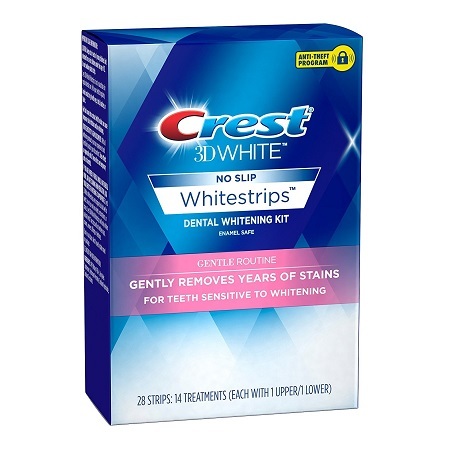 Crest 3D white Gentle Routine Whitestrips help reveal a whiter smile gently and gradually with just 30 minutes a day. Using enamel-safe whitening ingredients, Gentle Routine is designed to be easy on your teeth as it effectively whitens beneath the enamel surface. Advanced Seal Technology helps the strip to mold to the unique shape of your teeth and also come off cleanly and easily. Their no-slip grip means the strips stay put until you take them off, allowing you to talk and even drink water while whitening your teeth. Q: I have teeth sensitive to whitening. Can using Whitestrips make it worse? A: If you already have teeth sensitive to whitening, but still want to use Whitestrips, Gentle Routine Whitestrips offer less whitening-related sensitivity. Some people may temporarily experience a small amount of tooth sensitivity when using whitening products, which is completely normal, but know that Whitestrips are absolutely enamel safe. Q: How are whitening treatments different than whitening toothpastes? Do I really have to bother with two forms of whitening? A: Tooth stains can fall in two general categories: extrinsic stains and intrinsic stains. Extrinsic stains are stains at the tooth’s surface. Intrinsic stains are stains beneath the tooth’s surface. Although most whitening toothpastes are a great way to remove stains on a daily basis, most only work on the surface to provide an extrinsic benefit to your smile. Whitestrips, on the other hand, work both on surface stains as well as beneath the surface of the enamel. Going beyond where most whitening toothpastes leave off, Whitestrips whiten beneath the enamel surface for an overall whiter smile. Because of the extrinsic and intrinsic value of Whitestrips, you’ll see results that are noticeable. Q: Once I get a whiter smile, what is the best way to protect my new look? A: Once you’ve achieved the whitening results you want, one way to maintain your whiter smile and protect against everyday stain buildup is using Crest 3D White 5 Minute Touch-Ups. Crest 3D White Monthly Whitening Boost Strips are a quick, simple way to maintain your whiter smile. Another way to maintain your whiter smile is to use the collection of Crest 3D White products, which include toothbrushes, toothpastes and rinses. When used daily, the collection of Crest 3D White products will keep your smile whiter and brighter, guaranteed.